Improving post-harvest practices can help minimize produce damage and maximize the amount of quality produce that can be sold at market. Evaluating current post-harvest practices and identifying low-cost improvements is an important part of farm planning, and should be done as early in the season as possible. Rutgers Cooperative Extension of Mercer County and NOFA-NJ welcome Lee Stivers from Penn State Extension as she joins us remotely giving a presentation on post-harvest handling procedures for high-quality, marketable produce via webinar. The webinar workshop portion will be followed by a farm tour of Z Food Farm’s post-harvest handling set-up. 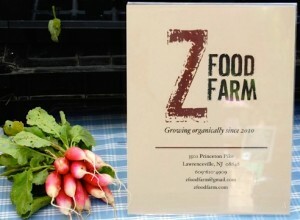 Z Food Farm is a small certified organic farm located in Lawrenceville, NJ. This workshop is geared towards small scale farm operations. Attendees will learn about post-harvest handling processes, management, respiration, ethylene production, transpiration, and more. Food safety issues will be touched on as well as recommendations for storage crops including, onions, carrots, winter squash, potatoes, and beets, ensuring their freshness and quality. For more information on this workshop and registration information please visit the NOFA NJ webpage.